Ta Da! : Fantastic Friday Finds! Goodwill was having a 50% off sale today! I cannot resist rummaging and good deals. My friend and I, went to a brand new store today in Etobicoke. The store smelled new and organized. The shopping was leisurely, and nobody was fighting for a cart. A very different 50% off experience than normal, which left us feeling like we did not satisfy our rummaging needs....until you looked at our overflowing shopping baskets. Why do we feel like we need to fight and race, and be flustered, to get a good deal? Are we conditioned to feel this way? Hmmmmm. Look at this haul!! I paid only $12.00!! Now, lets discuss each and every item, shall we? 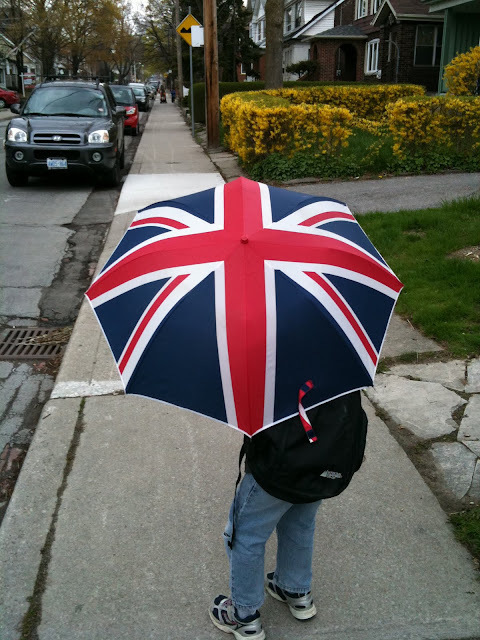 First of all, I mentioned the other day that all I wanted for Mother's Day was an umbrella, well cross that OFF the list as I found a Union Jack one for $1.50! Perfect! No holes, all wire intact, and it will fit in my bag. It might rain this afternoon...yeah!!! If my friend Monica is reading this...the wire rack is for your pantry. $1.00, and perfect for that cupboard. Glassware...the first section I go to in the store. This lovely grouping cost $2.75. Glass jar with lid, ideal for cat treats. Seal intact. 50's drink guide glass with instructions for Manhattans, Daiquiris, Old Fashioned etc. Nice and sturdy, and I might just have to make one or two tonight. Teeny Tiny butter dish with lid. Watch this one, as I have a FIMO creation circulating in my head, and I'll be sure to share in the next couple of weeks. Capt. Tony's SALOON glass. I don't know who Captain Tony is, but he sure looks surly, and he hails from Key West Florida. Ideal for my husband's whiskey sips. Crafting Section...another favourite of mine...and a section that I have to beat Amanda to, as she loves a great crafting find too. Little book of crochet hats. I don't know how to crochet. But now I can learn how for only $.75! Teeny Tiny Flowerpots!! The largest is 2 1/2" wide, and the smallest is 1 1/2". Cute, cute cute! Tiny cactus, pincushion, I don't know YET. But for $1.00 for the lot, I could not say NO. Last but not least, this set of four magnets. Handmade from Fimo and silk (you can see the "fingerprints" in the clay) Warriors perhaps. Only $.25!!! I don't know what W10,000 means, but it sounds expensive! So lovely, and came in a hand-made paper covered box. It should be gifted, but I cannot do it. Well, that's it for today. I feel very satisfied with my loot. By the way, it did rain, and I did get to use my new umbrella, and I was very happy.